With the Bach Consort of Worcester. Mozart penned his Great Mass in C minor 235 years ago as a present for his beloved fiance, Constanze. A true missa solemnis, it equals the power and emotion of his unfinished Requiem, and like it, is also an unfinished work. The Mass shows the influence of Bach and Handel, whom Mozart was studying at the time. 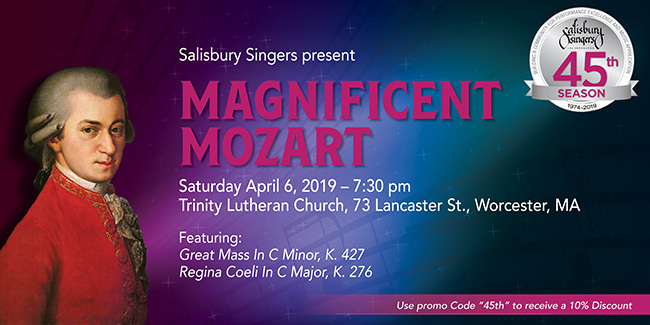 Salisbury Singers presents this magnificent work along with the shorter Regina Coeli in C Major. Salisbury Singers ushers in the holidays with their annual Holidays at WAM concert. Hear Worcester’s first performance of Dan Forrest¹s new work, LUX. This five-movement work explores various facets of LUX (Latin for light), in texts ranging from ancient liturgical chant to Scripture to modern secular love poetry. The music of LUX, written in 2018, was inspired thematically and spiritually by these profound texts; visually by the light in the Reims Cathedral in France and at the Poulnabrone Dolmen in Ireland; and musically by a variety of musical sources from ancient chant to modern minimalist composers. 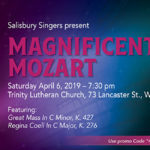 The concert will also feature the beautiful REQUIEM by Bob Chilcott, one of the original members of the Kings Singers. Chilcott, described by The Observer as ³a contemporary hero of British Choral Music², has become one of the most widely performed composers and arrangers of choral music in the world. These two works will be enhanced by the glorious acoustics of Worcester’s Cathedral of St. Paul. The collaboration of Leonard Bernstein and Stephen Sondheim produced West Side Story, a Broadway classic. Musicals such as Company and A Little Night Music cemented Sondheim’s reputation as a master songwriter and lyricist. Salisbury Singers presents a tapestry of the songs from these musicals and others, in a splendid evening of classic Broadway melodies.